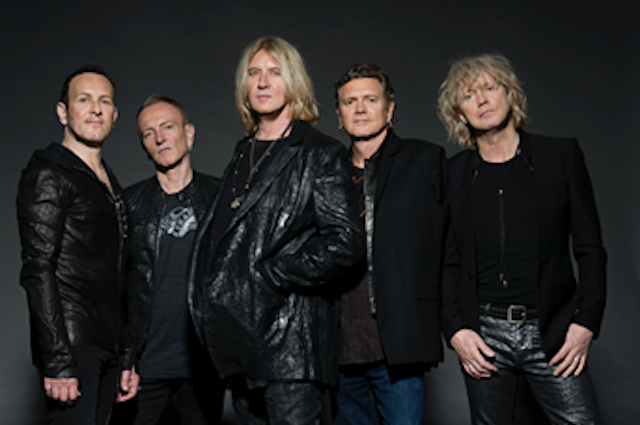 Def Leppard were officially inducted into the Rock N’ Roll Hall of Fame on March 29th. “First of all, massive love and gratitude to our very dear friend Brian May for such a flattering introduction. We love you, mate, and congratulations on the incredible success of the movie. It couldn’t have happened to a nicer chap..
I’d also like to congratulate all our fellow inductees tonight, it’s a real honor to be able to share this stage with the likes of Roxy Music, Stevie Nicks and the Zombies, artists that we’ve admired from a distance for many, many years. Alright, so down to business, we’d like to take this opportunity to acknowledge a few people, and some significant moments that have played a very important role in getting this band to where it is today, starting off with our parents. Back then, we were just a bunch of teenage wannabes living at home, dreaming the dream, so without their help and encouragement it would be a lot tougher to be standing up here on this stage tonight. My mum for example, taught me my first three chords when I was eight years old. I’ve learned two more since, but I’ve come to realize you don’t actually really need them at all. My dad who lent us £150 to make our first very recording back in 1978 which was absolutely the launch pad for this very wild ride that we’ve been on ever since. Now that’s just two examples of what our folks did for us along the way and I could stand here all night with great tales of parental support and what have you, but basically it’s of major significance, and it goes without saying that without their support, financial and otherwise, things may have turned out very differently. Another significant moment in this band’s birth was the simple act of missing a bus, which is something that I did one August night in 1977. By deciding to walk home instead of waiting for the next one, fate would have it that I would bump into a young kid who I knew to be a pretty good guitar player. That kid was a guy called Pete Willis. Pete was a co-founder of the band and one of the best right hands in the business. Now sadly Pete couldn’t be with us tonight, but I want to emphasize how very important Pete’s role in this band was in the early days. He was a terrific player, had a very mischievous sense of humor, but he brought plenty of great musical ideas to the band. And it was Pete, after a chance meeting in a college canteen, both reaching for the same guitar magazine, who introduced us to the late, great Steve Clark. Over the following 10 years, Steve made a massive musical contribution to this band, his incredible and unique riffs helped shape some of the most important songs we will ever write and it really does go without saying that we love him and we miss him every day. Two gentlemen who helped take us to a level that we could only previously have dreamt about were Cliff Burnstein and Peter Mensch. They formed Q-Prime management and they looked after us for the best part of 25 years. We will always appreciate the fact that Peter bankrolled this band for years until things started to take off — and boy, did they take off! But not before the most significant contribution that Peter and Cliff ever made, which was introducing our music to our future producer, co-writer and mentor, Mr. Robert John “Mutt” Lange. We first worked with Mutt in 1981 on an album called High & Dry, but it was 1983 that saw us move into a whole new orbit with the phenomenal success of the album Pryomania, where we were properly introduced to our new boss for the first time — our wonderfully loyal fanbase, without whom we wouldn’t be up here tonight, of that, I have no doubt. You’ve stayed on board for the best part of the following 36 years and supported us through some tough times along the way, but those tough times have helped us make this band what it is today — it’s solid, appreciative of who we are and what we stand for. Those songs we’ve written over the years were always our main priority, you just have to check out our misguided fashion sense over the years and you’ll understand where I’m coming from here. And although there seemed to be a looming sense of tragedy around every corner, we just wouldn’t let it in. But it’s true, it did seem that every time we made some musical headway, life would knock us back down somewhat. Pyromania is a raging success… then Rick has a life changing accident. He survived it and came out the other side stronger. Hysteria gave us the global success that we’d always craved… and then we lost Steve. But we survived and came out the other side stronger people. And that’s the way it’s always played out throughout our career. So let’s face facts here, if alcoholism, car crashes and cancer couldn’t kill us, the Nineties had no f–king chance. So finally I’d like to bring this into the now and thank the people who are helping to keep this beautiful machine on the road, hopefully for many, many more years to come. Our manager Mike Kobayashi who took over the reigns from Howard Kaufman who looked after us from 2005 until his passing in 2017. Howard did an incredible job breathing new life into this band at a time when it could have gone either way and Mike continues to do so, so thank you, Mike.